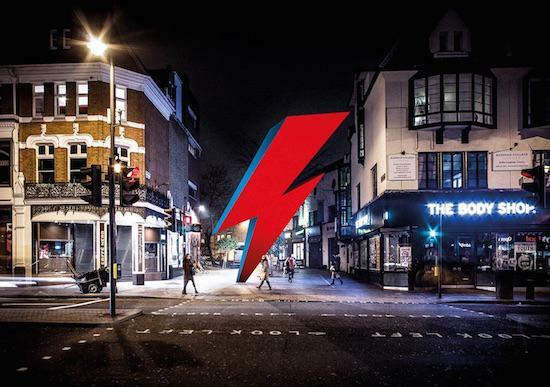 A nine-metre-tall lightning bolt memorial to David Bowie is to be built in Brixton, the South London neighbourhood where he was born. As The Vinyl Factory points out, a crowdfunding campaign for the memorial was launched today with the lightning bolt of course taking inspiration from Bowie's Aladdin Sane album artwork. It will be positioned immediately opposite the entrance and exit to Brixton's underground station, five streets away from Bowie's Stansfield Road birthplace. There are a selection of rewards promised to those who support the campaign including prints and the chance for your name to be included on the official Bowie memorial website. The project has so far been nine months in the making, but those behind it now say that they need the financial backing to push further with the idea.